After eight years of teaching chemistry, I was looking for a way to refresh my lesson plans. That’s when I signed up for RESET. Participating in AEOP’s Research Experiences for STEM Educators and Teachers (RESET) program and working with other science teachers from across the country, made designing new lesson plans, centered around the latest scientific research, a bit less daunting. This program gave me the opportunity to speak with other teachers, discussing best practices and brainstorming creative and effective lesson plans, all while working with scientists who spend their days in laboratories. The access to practicing scientists helped us all gain perspective on how to bring relevant experiments and materials back into the classroom. While participating in this summer program, we not only applied the 5E’s – engage, explore, explain, elaborate and evaluation – throughout the lesson development, but we also ensured that the lesson we ultimately created could be adjusted to suit any grade level. This experience has not only changed the way that I teach – bringing in examples from the latest science research – but has also given me a lesson plan that I see myself using every year from now on. The lesson that we constructed, which was designed to introduce the concept of molarity to our students, was developed over the course of four fantastic weeks. First, we read the resumes of the researchers we were working with. Next, we spoke with the researchers and figured out the theme of the lesson we would create. After these conversations, we spent time brainstorming together, creating a detailed action plan that guided our work. Over the course of the month, we also posted our weekly teaching progress on a shared Google Doc, where I exchanged my ideas and thoughts with other teachers in the program. The program also included a good deal of coaching. My program mentor provided me with a book about creative ways to teach, which has helped me think outside the box when it comes to developing lesson plans, in-class activities and evaluations. So how can you refresh your teacher toolkit? Sign up for RESET. Whenever anyone asks me about my experience in the program, I let them know that they should learn more and sign up. The community that we created and the lessons we shared over the course of the program have been invaluable to me. Now, I look forward to my annual molarity class. It’s one of my absolute favorite days of the year. Find more information about RESET here! 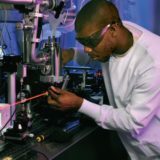 Research Experiences for STEM Educators and Teachers (RESET) provides teachers with summer research experiences and enhanced content knowledge at participating Army laboratories.